And All Participants Will win assured gift worth $199. 1. The promoter of the contest is DealMirror. 2. Employees of DealMirror or their family members or anyone else connected in any way with the competition or helping to set up the competition shall not be permitted to enter the competition. 4. The approximate prize value is $3798. 5. Contest begins on 14th of Nov, 2018 and ends on 25th of Nov, 2018. After this date there are no further entries permitted to the competition. The promoter reserves the right to change the beginning or end date. 7. Contestants will get 1 extra entries into the contest whenever they refer another valid person into the contest. 20. This promotion is in no way sponsored, endorsed or administered by, or associated with, Facebook, Twitter or any other social network. You are providing your information to DealMirror and not to any other party. The information provided will be used in conjunction with the United States standard Privacy Policies. The data gathered in this form will be used for promotional and marketing purposes, including marketing emails, cookies, and ads. By submitting your email, you've given us express consent to send you these emails. Our company, , and the software provider "VYPER" (DBA R Growth LLC) has access to this data. All data is held securely through a secure email service provider as well as through a secure database at VYPER. In the event of a breach of this data, we promise that you will be notified within 72 hours. You have a right to completely remove yourself completely from our database and have all records we hold on you to be removed. You also have a right to receive a copy of your data. You can achieve both by emailing us at or to VYPER at support@vyper.io. Remember that sometimes not getting what you want is a wonderful stroke of luck. Participate In This Giveaway!! Absolutely Free For All. Yes, 100% Free. The prize package is worth over $200,000 (USD)! But you have a chance to win it for free! To throw your name in the hat, all you have to do is use your email address. And if you really want to win, invite a friend to enter. Every time you do that, you’ll get Three bonus entries for yourself! What in the world are you waiting for? This giveaway won’t be around forever. 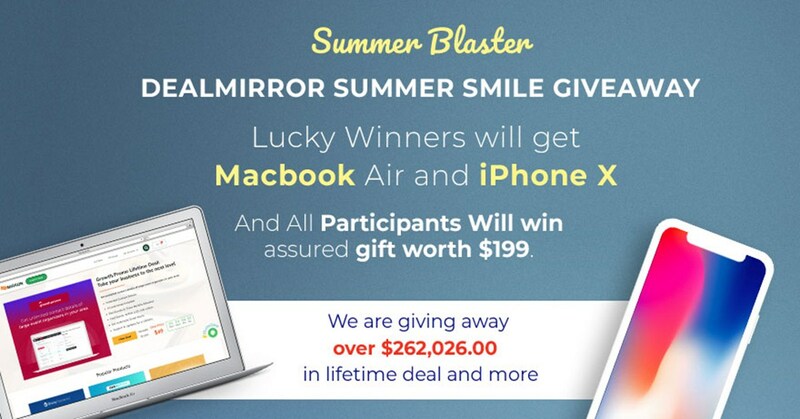 Your chance to win the Most awaiting DealMirror's Giveaway! Participate to win the exciting prize! Enter → Claim Your Free Gifts → Collect Additional Entries → Unlock More Free Gifts & Win The Grand Prize! !